This topic presents two reference architectures for installing Pivotal Cloud Foundry (PCF) on Google Cloud Platform (GCP): on a shared virtual private cloud (VPC) and on a single-project VPC. This topic also outlines multiple networking variants for VPC deployment. The architectures are validated for production-grade PCF deployments using multiple AZs. See PCF on GCP Requirements for general requirements for running PCF and specific requirements for running PCF on GCP. 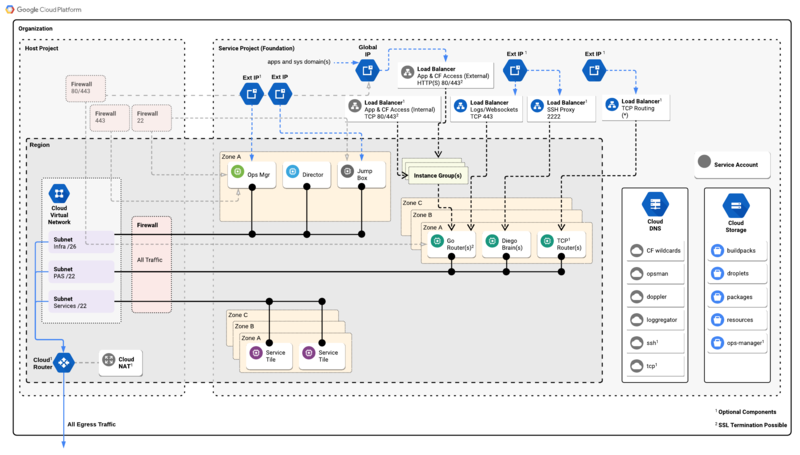 A PCF reference architecture describes a proven approach for deploying PCF on a specific IaaS, such as GCP. 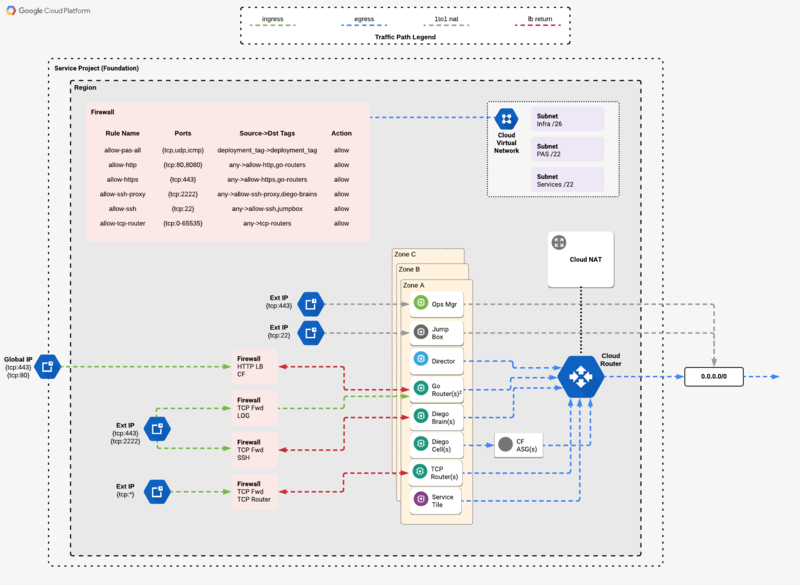 The following diagram provides an overview of a reference architecture deployment of PCF on a shared VPC on GCP. This architecture requires an organization on the VPC that contains a host project and a service project. For more information about shared VPCs on GCP, see Shared VPC Overview in the Google Cloud documentation. For more information about how this architecture divides resources between projects, see Host / Service Architecture. To expose a minimal number of public IP addresses, set up your NAT as shown in this diagram. To speed communication between data centers, use Google Cloud Interconnect as shown in this diagram. GCP allocates resources using a hierarchy that centers around projects. To create a VPC, architects define a host project that allocates network resources for the VPC, such as address space and firewall rules. Then they can define one or more service projects to run within the VPC, which share the network resources allocated by the host project and include their own non-network resources, such as VMs and storage buckets. To install PCF in a shared VPC on GCP, you create a host project for the VPC and a service project dedicated to running PCF. 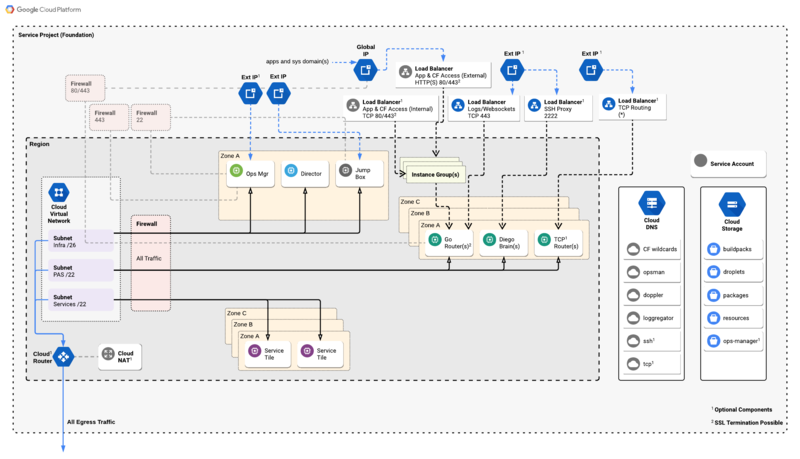 The following diagram provides an overview of a reference architecture deployment of PCF on a single-project VPC on GCP. The following table lists the components that are part of a reference architecture deployment with three availability zones. Domains & DNS CF Domain Zones and routes in use by the reference architecture include: domains for *.apps and *.system (required), a route for Ops Manager (required), a route for doppler (required), a route for Loggregator (required), a route for ssh access to app containers (optional) and a route for TCP routing to apps (optional). Reference architecture uses GCP Cloud DNS as the DNS provider. Ops Manager Deployed on the infrastructure subnet and accessible by FQDN or through an optional jumpbox. Gorouters Accessed through the HTTP and TCP WebSockets load balancers. 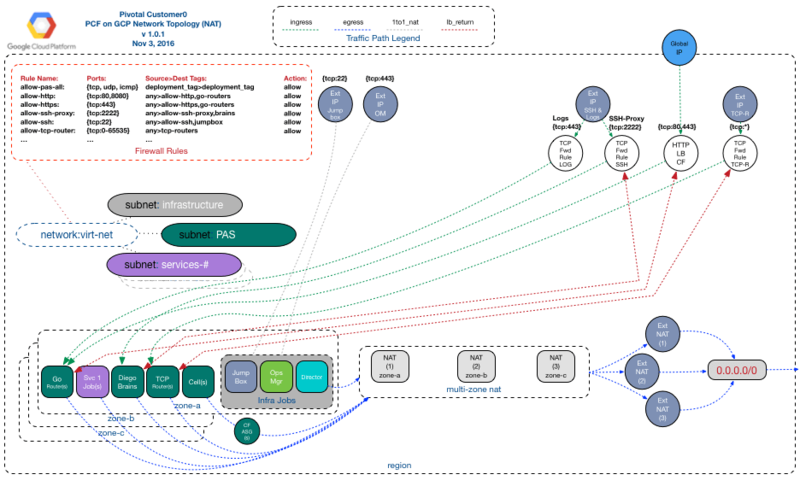 Deployed on the Pivotal Application Service (PAS) subnet, one job per availability zone. Diego Brains Required. However, the SSH container access functionality is optional and enabled through the SSH Proxy load balancer. Deployed on the PAS subnet, one job per availability zone. CF Database Reference architecture uses GCP Cloud SQL rather than internal databases. Configure your database with a strong password and limit access only to components that require database access. CF Blob Storage and Buckets For buildpacks, droplets, packages and resources. Reference architecture uses Google Cloud Storage rather than internal file storage. Services Deployed on the PCF managed services subnet. Each service is deployed to each availability zone. This section describes the possible network layouts for PCF deployments as covered by the reference architecture of PCF on GCP. NAT provides connectivity from PCF internals to the public Internet. The instructions for Installing PCF on GCP Manually use this method. Every PCF VM receives its own public IP address (no NAT). The instructions for Installing PCF on GCP using Terraform use this method. However, if you require NAT, you may refer to the following section. This diagram illustrates the case where you want to expose only a minimal number of public IP addresses. If you prefer not to use a NAT solution, you can configure PCF on GCP to assign public IP addresses for all components. This type of deployment may be more performant since most of the network traffic between Cloud Foundry components are routed through the front end load balancer and the Gorouter. The following table lists the network objects expected for each type of reference architecture deployment with three availability zones (assumes you are using NAT). This section provides more background on the reasons behind certain network configuration decisions, specifically for the Gorouter. Unencrypted HTTP traffic on port 80 that is decrypted by the HTTP(S) load balancer. Encrypted secure web socket traffic on port 443 that is passed through the TCP WebSockets load balancer. TLS is terminated for HTTPS on the HTTP load balancer and is terminated for WebSockets (WSS) traffic on the Gorouter. PCF deployments on GCP use two load balancers to handle Gorouter traffic because HTTP load balancers currently do not support WebSockets. GCP routers do not respond to ICMP; therefore, Pivotal recommends disabling ICMP checks in BOSH Director network configuration.